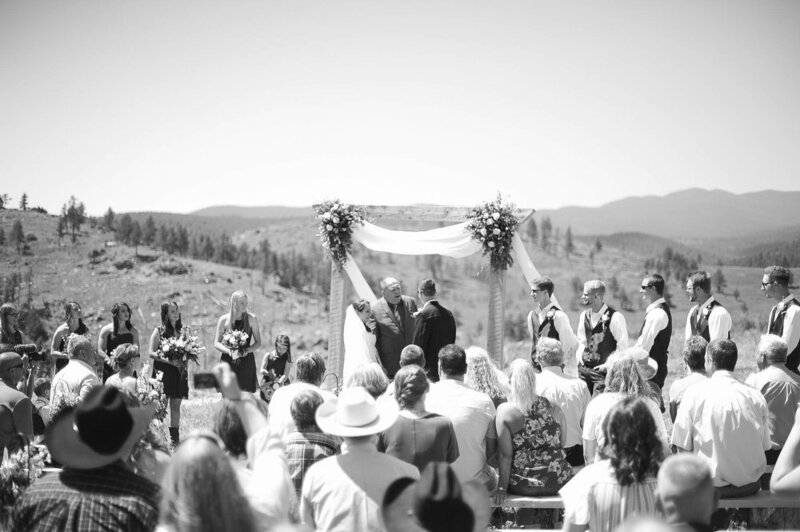 Josh and Emma tied the knot at his family’s mountain home, surrounded by friends and family and incredible mountain views. This intimate wedding was put together with the help of their family and friends, and each and every piece of this day was hand tailored for Josh and Emma. When Emma and I first met to chat about her wedding photography, she emphasized how important each detail was to them and how important it was for me to capture them. As important as the day was for her and Josh, it was equally important to her that the people she loved and cherished were pouring out their talents for her. Her appreciation was evident, as was the talent in this group of people: From the benches, with “J & E” branded on them (that will be used to make a bed frame for their new home), the arbor made by the groom, the incredible flower arrangements created by the groom’s mom, the cake baked by the bride’s sister, and the homemade raspberry jam made by the bride as favors, this day was steeped with intimacy and intention. Emma, Josh, and the rest of the people who made this day possible should be so proud of the amazing day they created to celebrate this union. Josh and Emma have been together for quite a while, and their wedding day was the joyful culmination of all of that time. Emma cheered as she walked down the aisle, so newly Josh’s wife. Their uncontainable joy was evident to each and every person that was there. Congratulations, you two! You’ve just begun the most beautiful journey!